Seasoned Baked Sweet Potatoes Wedges recipe with tips to bake extra-crispy wedges. A delicious and healthier snack ready in no time. Seasoned Sweet Potato Wedges, baked not fried yet crispy from outside and perfectly moist inside. Low-oil, healthy snack or dinner side to enjoy whenever. Only needs 10 minutes of active prep time. Gluten-Free, Low-Oil. Sweet Potato has amazing savory flavor. These make perfect sweet and salty snack. Today, I'm sharing easy tips to make extra-crispy sweet potato wedges. 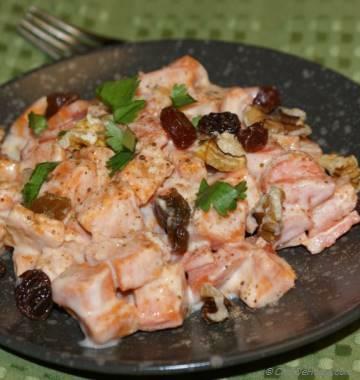 Also sharing lots flavoring ideas to make this snack your own. So, let's bake some sweet, spicy and crispy Sweet Potato Wedges! To make baked sweet potato wedges, I preheat oven at 450 degrees Fahrenheit. Once wedges are cut and ready to bake. I coat'em with olive oil and season with spices - mix of paprika, garlic, onion and cayenne. That's it. Place on baking sheet, bake and serve. Preheat Oven and Baking Sheet: While preparing (cutting) sweet potato wedges, pre-heat oven at 450 degrees Fahrenheit. And place a baking lined with aluminium foil in the oven to preheat. TO bake wedges, I place those on preheated baking sheet to get extra crispy from outside. Don't overcrowd the Baking Sheet: Don't put lots of wedges on one sheet. Use two sheet if needed. Less crowded wedges will have space for heat to circulate. Result is crispier baked sweet potato wedges. Broil for last 1-2 minutes of baking: Broil baked wedges for last 1-2 minutes for that extra caramelized crispy outside. Place keep an eye. Don't let's burn. Follow above three and you will always serve perfectly baked and crispy sweet potato wedges. 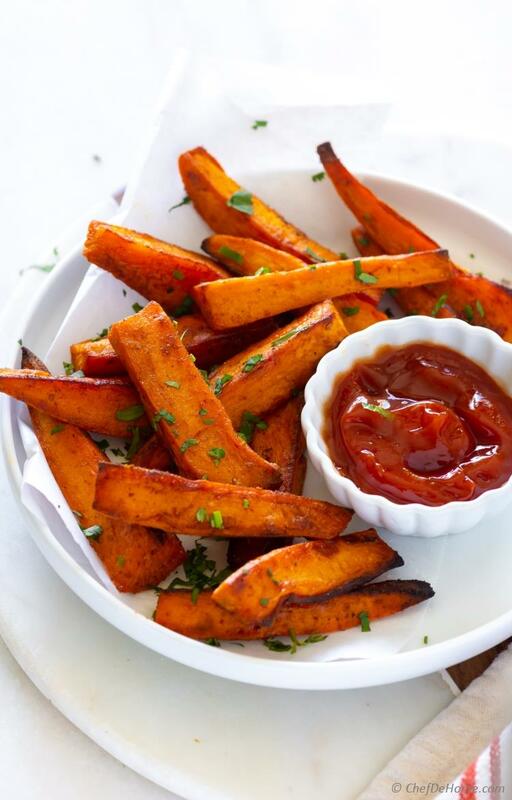 Sweet Potato Wedges or Fries, this snack is not complete without side of a delicious dip. Always serve ketchup on side. Plus pick a dip your choice form recommend recipes. 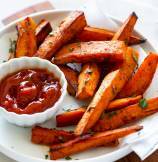 Dig some sweet potatoes from pantry and bake some Potato Wedges for snacking tonight. Don't forget to serve a delicious from suggestion above. Total Time 40 minutes Prep Time 10 minutes Cook Time 30 minutes Difficulty Easy Yields 1 Pound Wedges Serves 5 Notes No. of servings depends on serving size. 1. Preheat oven at 450 degrees Fahrenheit. Line a baking sheet with aluminium foil. Place in oven. Mix all dry spices in a small bowl and set aside. 2. Wash and peel the sweet potatoes. Trim the ends. 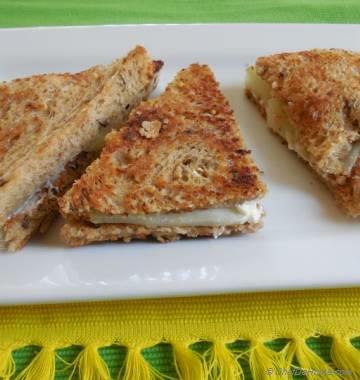 Cut into two parts lengthwise, then make three wedge from each half. 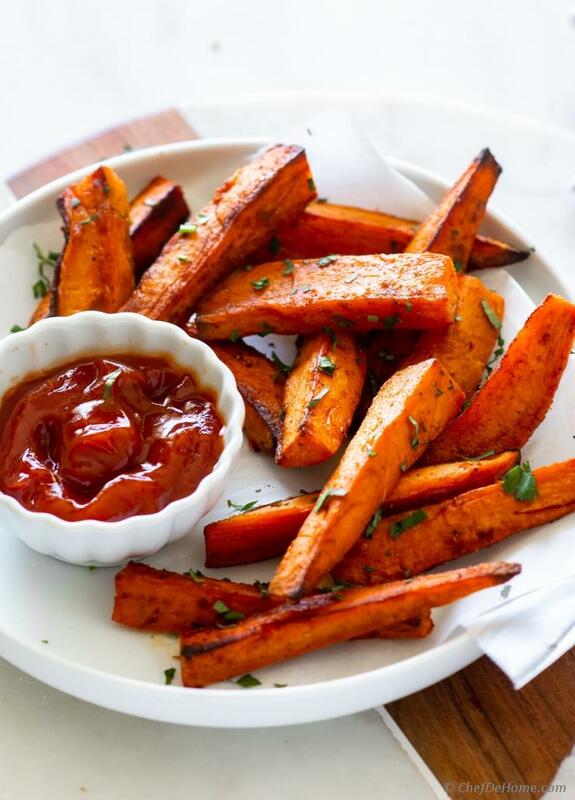 You can also cut long sweet potato's wedges into half . 3. Place cut wedges in a bowl. Add oil and massage to coat all wedges in oil. Sprinkle seasoning mix on top. Fold to coat well. 4. Take baking sheet out of oven. (Be careful it will be hot). Place seasoned sweet potato wedges onto baking sheet, cut side down. Space each wedge at-least an inch apart for better heat circulation. Bake for 20-25 minutes. Half way through cooking, take out baking sheet. Flip each wedge to make second cut side down. Put back in oven and continue baking. 5. Once timer is up. Switch oven to broiler and broil for 2-3 minutes. (Keep an eye to prevent burning the wedges). 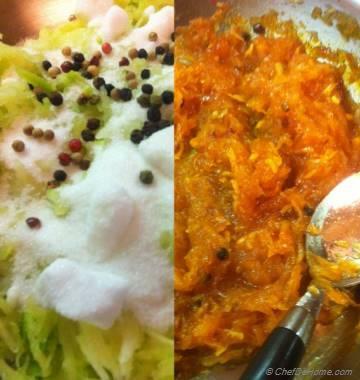 Transfer wedges to wire rack and sprinkle with pinch or two of salt, fresh black pepper and chopped parsley. Serve immediately with side of ketchup or dip of choice. Preheat Oven and Baking Sheet: While preparing (cutting) sweet potato wedges, pre-heat oven at 400 degrees Fahrenheit. And place a baking lined with aluminium foil in the oven to preheat. TO bake wedges, I place those on preheated baking sheet to get extra crispy from outside.